It’s feast or famine with this self-sufficiency malarkey. For months on end you produce hardly any food at all, then come the end of August you have fruit and veg coming at you from all angles. There are wild mushrooms to be foraged, apples and damsons to be picked and vegetables to be harvested. Our most successful crop this year, by quite a margin, was our courgette (zucchini) crop. At first it didn’t look promising. I began early, planting seeds under glass way back in April. I nursed the seedlings until they were strong and healthy and until the earth had warmed enough to be a gentle mother. I planted them in our little vegetable plot and tended them carefully. I don’t know where I went wrong, but every single one of them died. Not one to be easily outdone, I started again. I bought new seed and, as the weather was now warm, planted them directly in the garden. Life was busy and distracting and I promptly forgot about them. When I finally made it back to the garden several weeks later I was delighted to see they had popped their little heads above ground and were growing rather nicely. They grew and grew and grew and I began to understand why the books had advised to plant them so far apart. Too late now, I thought – we’ll just have to run with this spacing and see what happens. I need not have worried. My courgettes continued to go from strength to strength. 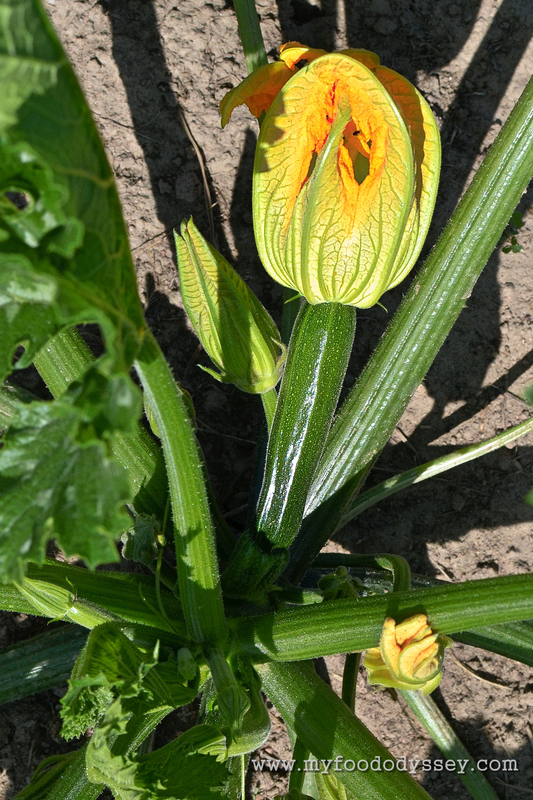 In early August they began to develop flowers and I knew that lush green courgettes were on their way. Sure enough, small fingers of green emerged from the flowers, fingers that seemed to grow exponentially with each passing day. The first batch were ready for picking not long after their initial appearance. I was beside myself with excitement. Courgettes are one of my favourite vegetables and we bought them year round when we lived in Ireland. Depending on the time of year they could be quite pricey. Here I was with my own steady supply of “free” organic courgettes. I was in heaven. Then all of a sudden it got out of hand. I had way too many. They kept growing and growing and I kept picking and picking. Courgettes are at their best when picked before they get too big – less than 2 inches in diameter is ideal. They were appearing and growing at a rate of knots and soon my crisper drawer was full of them. I began to panic – how on earth was I going to use this fabulous courgette glut? I cannot abide waste of any kind and I wanted to make sure they all got eaten. 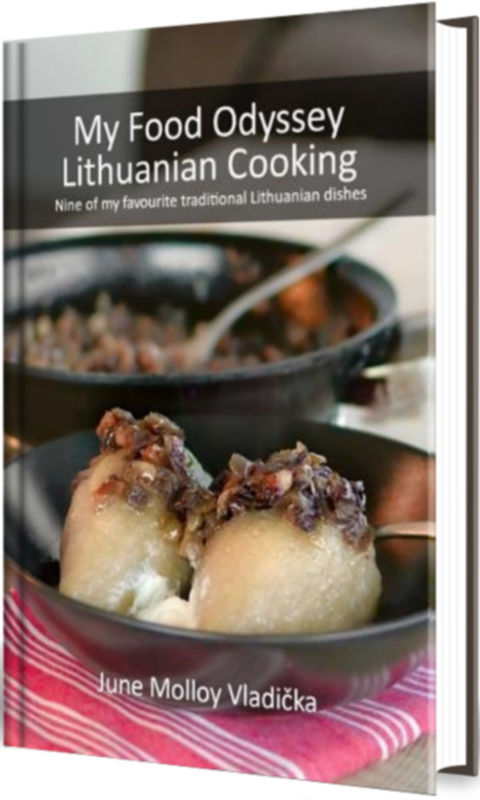 I tried freezing them and that failed miserably – they turned to mush when defrosted. I considered dehydrating them but couldn’t imagine that working either. So I did what every modern girl does – I put a call out on Facebook. I got plenty of responses – courgette bread, soup, spaghetti, fritters, lasagne, jam, chutney and many more. I tried almost all of them but my favourite, and the most popular with friends and family, was the courgette bread. 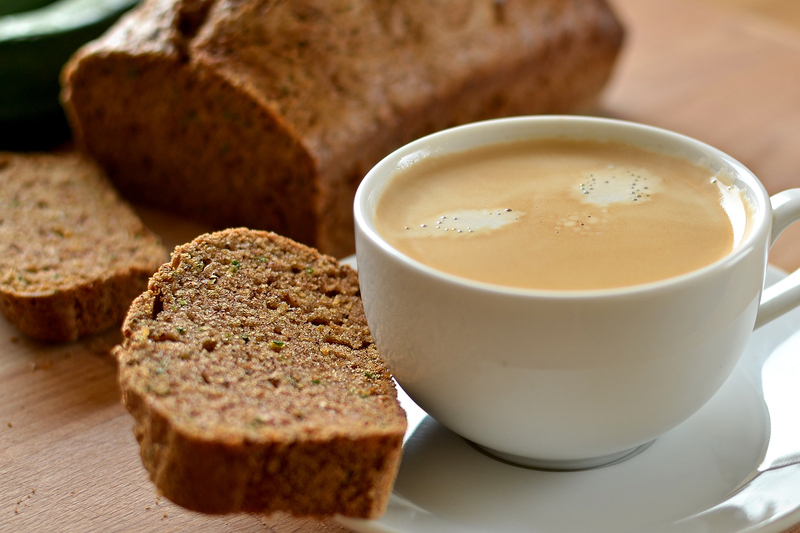 I tend to call it cake rather than bread because the inclusion of sugar and eggs makes it quite cake-like, but courgette bread seems to be the popular name. With its warm hit of cinnamon it reminds me of carrot cake but it is far moister than any carrot cake I have tried. The crust is just a teeny bit sticky and the crumb is soft, moist and fluffy. It’s the perfect cake. And the best bit? It’s so easy to make. 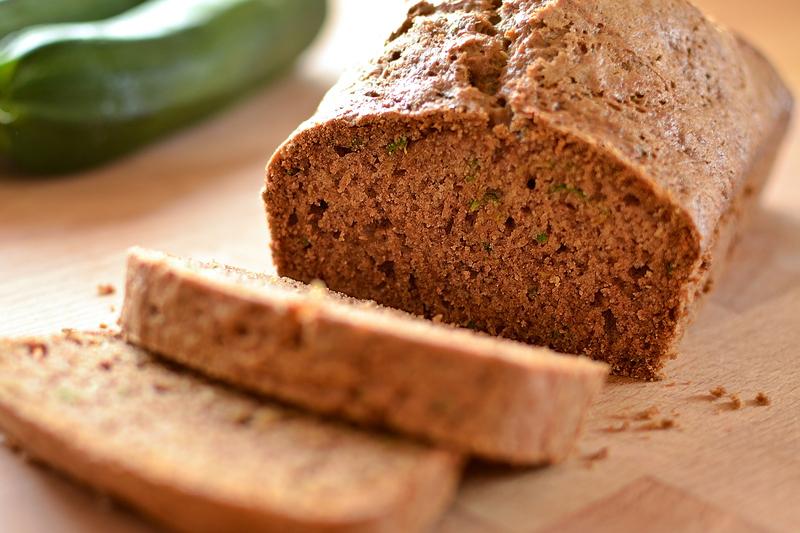 The batter for this courgette bread can be mixed in minutes, especially if you have a food processor or stand mixer. You do need to grate the courgette, but as you only need one large courgette this doesn’t take very long, even if you need to do it by hand. I was initially disappointed that I only needed one courgette per batch, but I got over this by making multiple batches, each one seemingly tastier and stickier than the one before. Loaves were literally walking out the door – the neighbours all got one, even the plumber got one! This cake is definitely a crowd pleaser. Preheat the oven to 160˚ C (320˚ F) and lightly oil and flour your muffin or loaf tins. Add the eggs, oil and sugar to a large bowl and whisk until the mixture thickens to the consistency of double cream. Add the flour, cinnamon, salt and baking powder to the egg mixture and whisk or beat to combine. Add the grated courgette (including any juices) to the bowl and fold into the mixture with a spatula or spoon until well combined, with no clumps of courgette remaining. Spoon the mixture into your muffin or loaf tins. 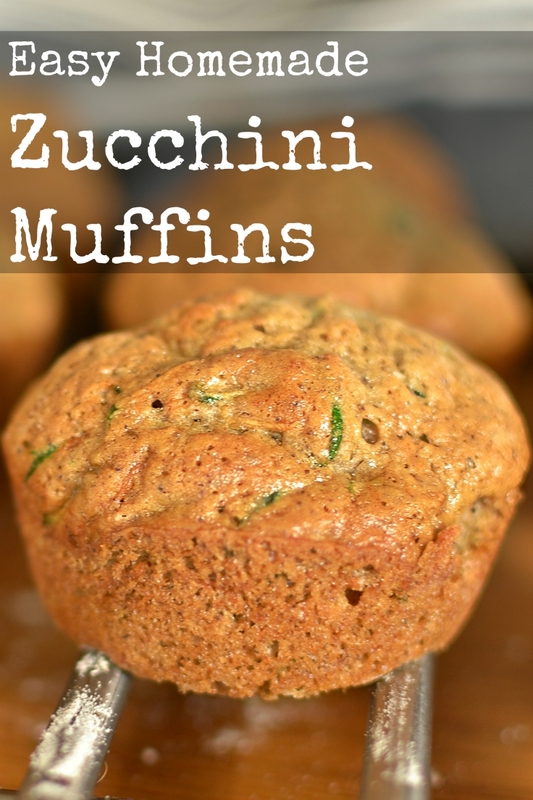 Use approximately 1 tablespoon for each muffin to ensure even distribution. Bake muffins for 20 minutes or until a skewer or cocktail stick inserted into the middle of a muffin comes out clean. Bake half the mixture in a 450 g (1 lb) loaf tin for 50 minutes or until a skewer or cocktail stick inserted into the middle of the loaf comes out clean. Cool on a wire tray. The muffins or loaves are ready to eat as soon as they are cool. They keep for about 1 week in an airtight container or ziplock bag. They also freeze well. Using a stand mixer, food processor or electric hand whisk reduces the effort required to make this bread. However, it can also be made with just a balloon whisk and a wooden spoon. The mixture does become quite dense when you add the flour so you’ll need a strong arm. I grate the courgette with my food processor before proceeding to mix the batter. However, as you only need to grate one large courgette, you can easily grate the courgette with a simple box or plane grater. You will notice that juices start to drain from the courgette once it has been grated. Do not strain off this juice – it is a necessary ingredient to keep your bread deliciously moist. This recipe yields 24 small muffins or two 450 g (1 lb) loaves. I usually make a mix of each – 12 muffins and 1 loaf. I don’t mind this volume as the bread keeps for well over a week in an airtight container. They also freeze well. If you feel you don’t need this amount you can half the quantities and make either 12 muffins or 1 loaf. UPDATE AUGUST 2017: I recently shared a photo of this recipe baked as a sandwich cake with cream cheese frosting. A few people have asked for the recipe. For the cake, I make a full batch of the batter above and divide across two 20 cm (8 inch) cake tins and bake at 160˚ C (320˚ F) for 40 mins. For the frosting I combine 400 g (14 oz) cream cheese, 225 g (8 oz) salted butter and 225 g (8 oz) powdered sugar, whisking until smooth. Use 1/4 of the mixture between the two layers, 1/4 for the top and half for the sides. Photo below. Did anyone else have a courgette glut this year? Any other suggestions on what to do with them? I turned my back for a minute on my one courgette plant and I now have a very large marrow, so I guess I will be making my mustard pickle early this year and also be using your recipes to make some courgette soup and muffins to freeze. Thank goodness for chest freezers and preserves, I do hate waste 🙂 especially when you spend ages nurturing these plants from seeds. I’ve been diligently picking while they’re small this year to keep the size down. I swear I missed one day when I had guests and went out to find 3 or 4 huge courgettes! Not quite marrows, but big nonetheless. They’re earmarked for soup, which I will freeze. Thank goodness for chest freezers, indeed – it really would be awful to waste them, especially when they’re completely organic. It would cost a fortune to replace them. Enjoy the soup and muffins! Stagger your planting for zucchini so the glut doesn’t become too overwhelming. I also try to stagger planting for lots of other veg. However saying that there are some veg (e.g. Tomatoes) that a glut is welcome in order to create sauces and pastes. Thanks, Brooke! I did stagger my lettuce this year as they get overgrown very quickly but I never thought I’d have such a problem with the zucchini! Will definitely be doing more staggering next year. I did a (fairly) recent post on courgette salad with red onion, pickled dill, or some such fancy name. Another one is with spinach and goats cheese, or similar to make a timbale, not sure I have posted that. The obvious soup ones, mine was courgette and parsley. We’re having some tonight in salad. Depends what you food choices are really. I don’t have a big enough garden to get a glut enough of anything! Thanks – I’ll check out that recipe! I WISH I didn’t have much of a sweet tooth. The bane of my existence, lol. The good thing about onions though, you can use them in so many more recipes. A little more user friendly than zucchini. Right now we are neck deep in tomatoes. I’m eating them like candy straight out of the garden. I’m going to go into withdrawals when they run out, lol. I can’t wait to get my greenhouse so I can have my own tomatoes. The ones from the store just don’t taste the same. I don’t think I’d ever get tired of them as they’re so versatile. Maybe not quite as versatile as onions, but pretty close! Lucky you. Zucchini didn’t do well in my little garden, not enough sun I guess. I think I literally did get lucky with the time I planted it. I think I have a note somewhere so I can do the same thing again next year! I’ve had courgette cake before and it was delicious! Have you tried pickling them? The courgettes, not the cakes. I saved a few of the big, overgrown ones for pickle / chutney, Simone. They’re all chopped and ready to go – I’ll let you know how it turns out! Eh, of course! Actually, as cakes go they’re not too bad. 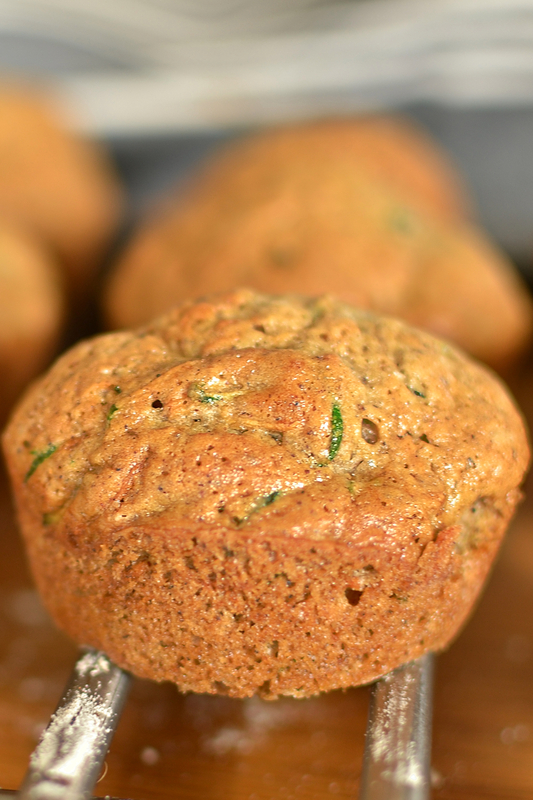 The courgette bulks up the batter quite a bit so the amount of sugar and fat in each portion is reasonable. But who cares – they’re yum! Aren’t they one of the most exciting things to watch growing? The bread/cake sounds delicious. They’re seriously yum, Lyn – I definitely recommend them. I don’t have a big sweet tooth but the cinnamon in these makes them the perfect side to a cup of coffee! If you ever come across a recipe for an avocado cake (not that I expect you’ll be cultivating avocados! ), do pass it on. I have this notion that avocado would make a wonderful chilli chocolate cake but I don’t know enough about food chemistry or mechanics to try something out. That sounds yum, Lyn! I’ve seen a few sweet recipes that include avocado as the fat so I can see how a chocolate cake would work. I must see if I can find a recipe. I’ll let you know!